Reading at the final second of the minute. Firstly, 40 seconds is not one minute, the integration period recommended by the WMO in 2014 and by the Bureau’s own officers in 1997. Anything less than 60 seconds is not compliant. Secondly, consider this plot, which is from actual 1 minute temperatures recorded at Hervey Bay Airport on 22 February 2017. (Data purchased by me from the Bureau). Sunrise was at about 5:40 a.m. Temperatures do not increase until about 6:30 a.m. Note the strangely low temperature- the daily minimum- which was reported as occurring sometime in the 60 seconds before 06:00:00. The BOM would have us believe that each of the values in Figure 1, including the low of 23.2C, are “averages” of the previous 40 to 80 seconds. Next consider what happens in that minute from 5:59 to 6:00, as per the following plot. We don’t know in which seconds the high and low readings for that minute occurred, so I have shown them for each of 59 seconds. I have shown the 5:59 and 6:00 readings: both were 25.3C. If by an “average” (however derived) of less than 60 seconds, the methodology is non-compliant. If by an “average” of the previous 60 seconds, it must include values that contributed to the High of 25.4C and the Low of 23.2C. If by an “average” of anything greater than 60 seconds, it must include values that contributed to both the Low and High values, and as well, values that contributed to the 5:59 reading- which is the same as the 06:00 reading. Similar logic applies to the Low and High readings. It follows that the intermediate instantaneous atmospheric temperatures that contributed to all three reported “average” values must have ranged from much higher than 25.4C to very much lower than 23.2C. Look at Figure 1 again. 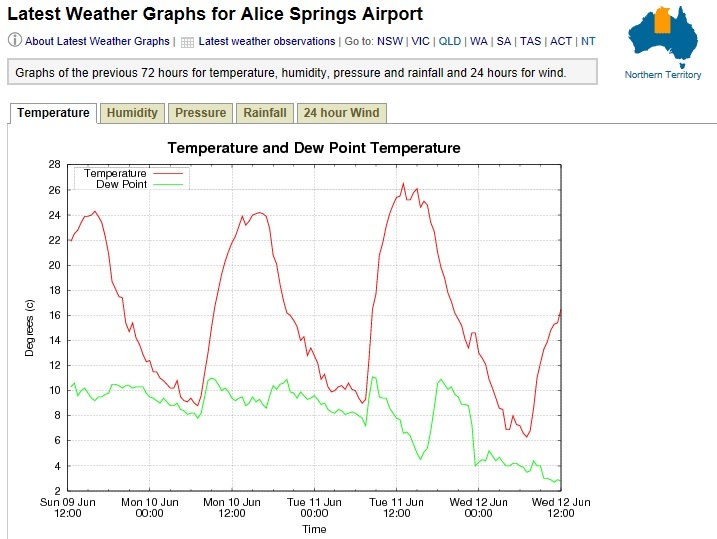 The air temperature at Hervey Bay on 22 February must have spiked down very much lower than the 23.2C plotted. In the early morning there is very little near ground turbulence so temperatures do not fluctuate from one minute to the next by very much. In How Temperature Is Measured in Australia Part 2 I showed that 91% of low temperatures vary from final second temperatures in the same minute by 0.2C or less. A difference of 2.1C is extraordinary. Fluctuations greater than that are difficult to believe. However, in a comment at How Temperature Is Measured In Australia Part 1, Tony Banton, a retired meteorologist, says that the BOM explanation of cooler ground level air mixing upwards is correct. If we accept that explanation, we must then face the problem of “comparability”. 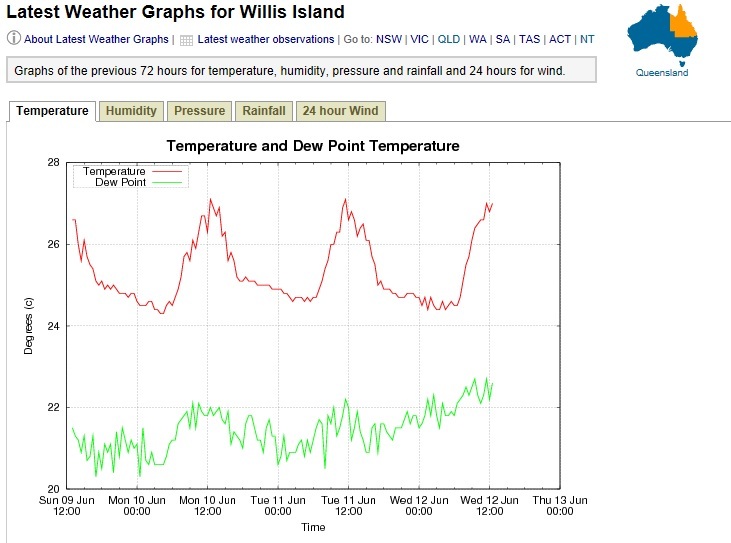 In 61 seconds, the Hervey Bay AWS has reported temperatures of 25.3, 25.4, 23.2, and finally 25.3 degrees. The BOM asserts that a liquid-in-glass thermometer will be able to respond as quickly and show similar temperatures- and remember, 23.2C was the morning’s official minimum. My response: rubbish. The data for 22 February at Hervey Bay show that no averaging is used at all, and the Low Temperature of 22.3C 23.2C is an instantaneous one second recording from a rogue downwards spike, whatever the cause, whether a natural event or other (e.g. electrical) factor. 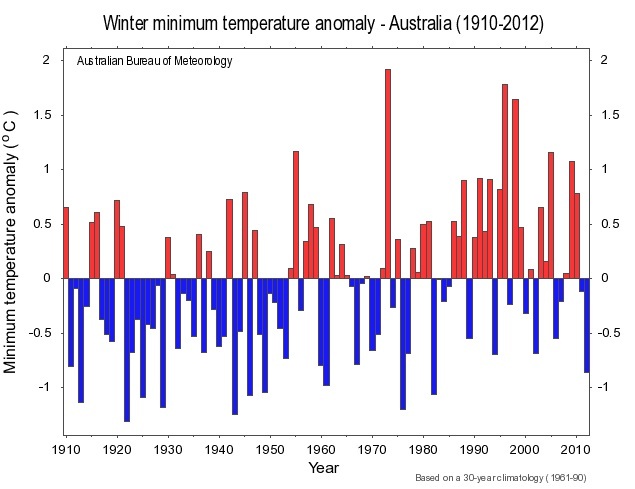 Temperatures reported by the BOM are not fit for purpose of accurate reporting of maxima and minima, identifying records, or identifying warming or cooling by comparison with historic liquid-in-glass data. The complete UAH v6.0 data for September have just been released. I present all the graphs for various regions, and as well summaries for easier comparison. The Pause has finally ended globally and for the Northern Hemisphere, and the Tropics, but still refuses to go away in the Southern Hemisphere. These graphs show the furthest back one can go to show a zero or negative trend (less than 0.1 +/-0.1C per 100 years) in lower tropospheric temperatures. 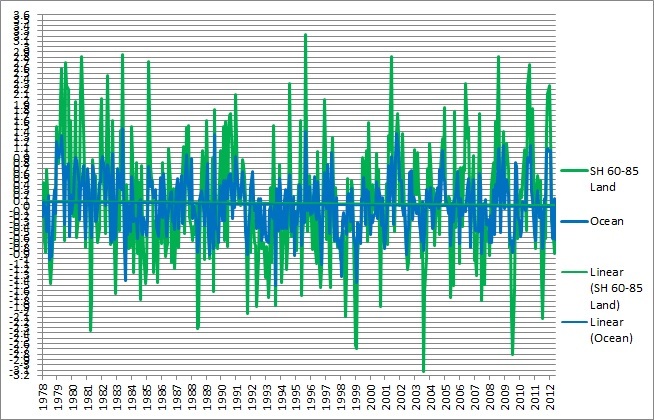 I calculate 12 month running means to remove the small possibility of seasonal autocorrelation in the monthly anomalies. Note: The satellite record commences in December 1978- now 37 years and 10 months long- 454 months. 12 month running means commence in November 1979. 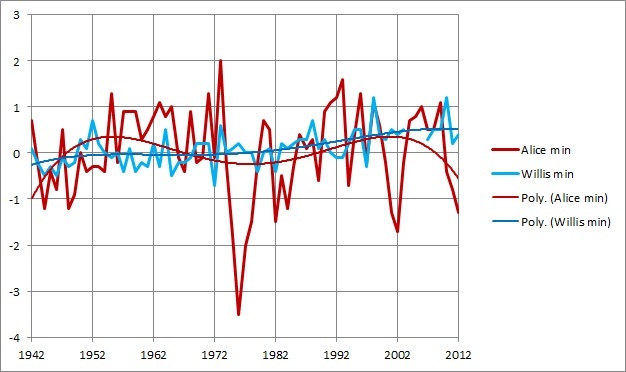 The y-axes in the graphs below are at December 1978, so the vertical gridlines denote Decembers. The final plotted points are September 2016. The Pause has ended. A trend of +0.18 C/100 years (+/- 0.1C) since March 1998 is about one sixth of the trend for the whole record. The Northern Hemisphere Pause has ended. For well over half the record, the Southern Hemisphere still has zero trend. The Pause may end shortly. As expected, the Pause in the Tropics (20N to 20S) has ended. The Pause remains (just) for ocean areas. The minimal trend is creeping up- how high will it go before decreasing again? The Pause is one month longer. Another big increase in temperature in this region but the minimal trend is still one seventh that of the whole record. The South Polar region has been cooling for the entire record- 36 years 11 months. Due to family reasons, I can’t give much attention to this blog for a while. 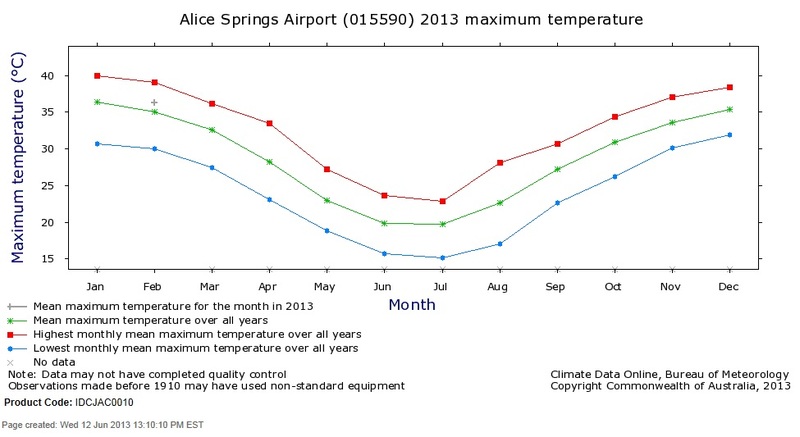 I’ll leave you with two graphs to contrast climate alarmism about heatwaves with reality. Let’s look at Brisbane. Dr Perkins, a heatwave expert, defines a heatwave as “three days in a row of temperatures in the top 10 per cent”. The top 10% of days are those with a temperature above 29.5 degrees Celsius. Yep, 29.5 C is apparently an extremely hot day at Brisbane Airport! This shows consecutive days above 29.5 C- the red line is the 3 day heatwave benchmark. Note the linear trend. and Brisbane has ALWAYS had heatwaves in spring, but not so many nowadays. There has been a slight increase in the number of standalone days above 29.5 C (0.17 days in 66 years), but ‘heatwaves’ have been getting COOLER. I will look at the 2nd point above, that is, greater continental than oceanic warming. This is possibly the silliest of Dr Braganza’s claims. It does not need very great understanding of physics, meteorology, or geography, to see that continents will warm faster than oceans as a result of ANY cause- greenhouse or otherwise- and on any timeframe. 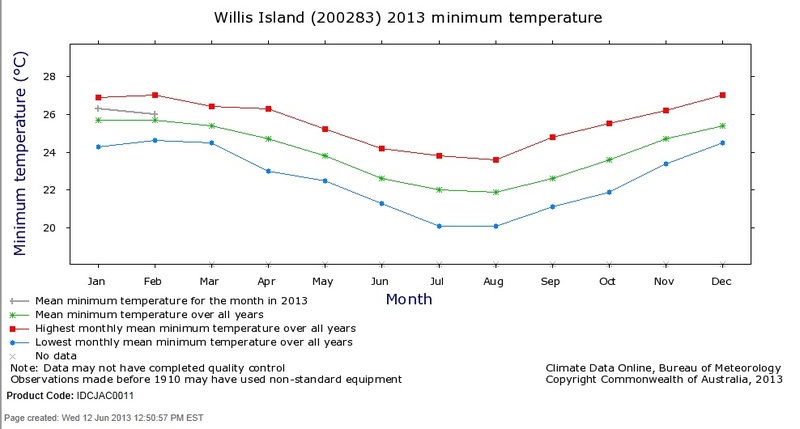 Let’s consider two temperature stations maintained by the Bureau of Meteorology (BOM)- Willis Island 200283, in the middle of the Coral Sea, and Alice Springs 015590, in the middle of Australia. 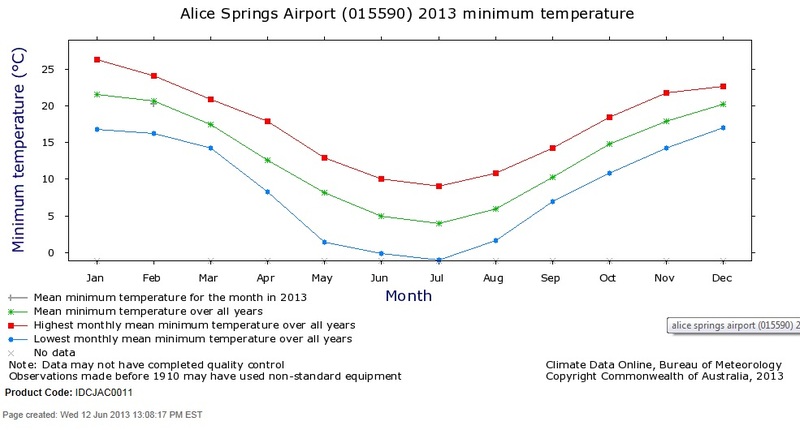 On all timescales, whether warming is caused by daily, seasonal, or inter-annual factors, Alice Springs warms (and cools) much more rapidly than Willis Island. Perhaps the specific heat of water compared with land has something to do with it? Now let’s look at the global picture. 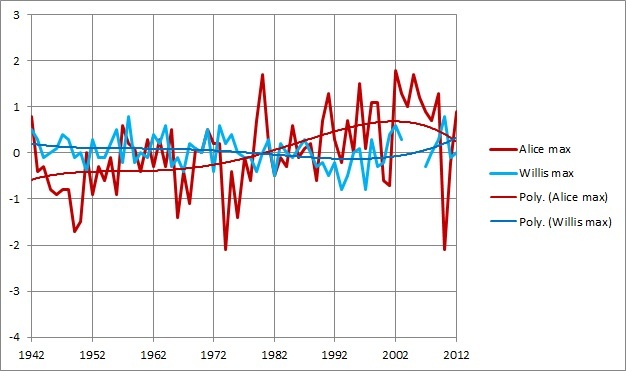 These graphs use data from the University of Alabama (Huntsville) satellite record (UAH) to show the December 1978-May 2013 comparison for Land and Ocean from 85N to 85S. Practically identical trend lines for Land and Ocean! Once again it is obvious that “Global” Warming is predominantly a Northern Hemisphere phenomenon. The Southern Hemisphere refuses to follow Dr Braganza’s claim. Further, the greater the proportion of land to ocean (Northern Hemisphere), the more land warms relative to the oceans. Far from being a pattern of temperature change uniquely associated with the enhanced greenhouse effect, this illustrates the higher thermal response of land compared with water. The only band where the temperature range of the ocean is close to that of the land is the Tropics, which is mostly ocean, and which is the driver of world climate. FOUR of his fingerprints of climate change are missing. Warming Has Paused, BOM Says! Sorry, that title is a little misleading, isn’t it. The Bureau of Meteorology didn’t actually say this, but the BOM’s own data does. Loudly and clearly. 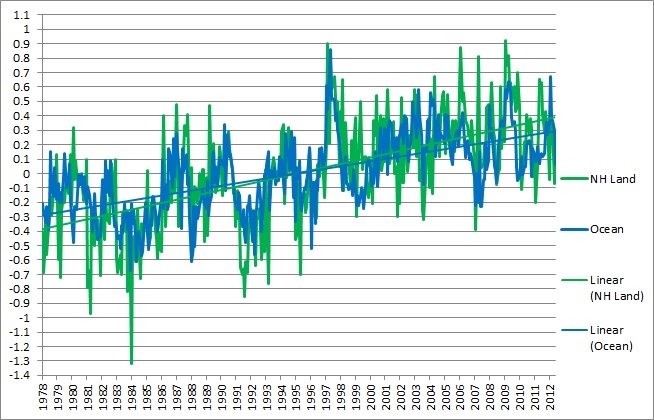 The Bureau’s brand-new, best quality dataset, ACORN-SAT (Australian Climate Observation Reference Network- Surface Air Temperatures) clearly shows the linear trend has been flat for 18 years. 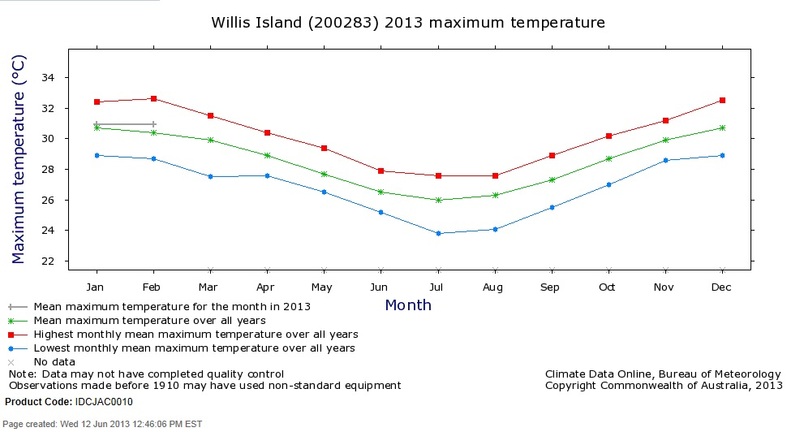 So what of the Climate Commission’s report on “The Angry Summer” , and the Bureau’s apparent fixation with maximum temperatures in the past summer? 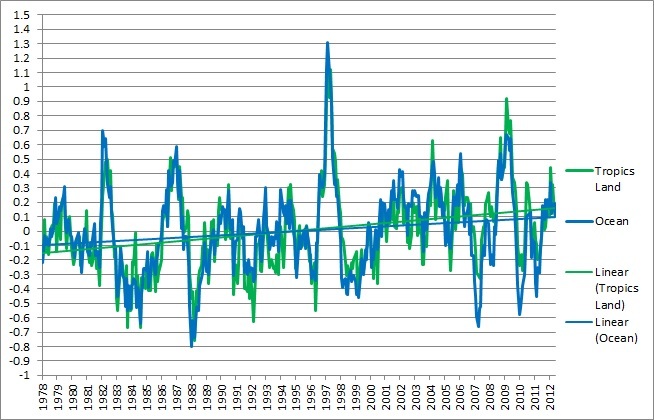 In the past, the BOM has been at pains to make clear that trends in climate can only be analysed over long periods of time. 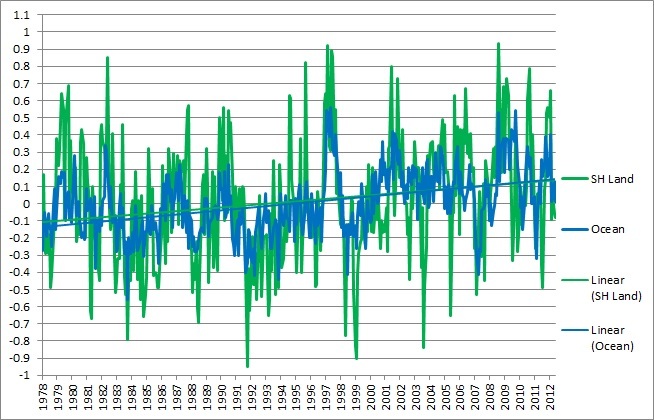 See for example, http://www.bom.gov.au/climate/glossary/climate.shtml Three cold months have barely rated a mention in the past for this very good reason. So why all the fuss over three hot months? And if it is now OK for them to use a three month period in this way, surely it is OK for sceptics to point to a “pause” in warming over the past several years. A period of 18 years is 72 times longer than the “Angry Summer”! I was astounded that some commenters at the various sites where this was published had doubts about the accuracy of the UAH data. You can’t help some people. 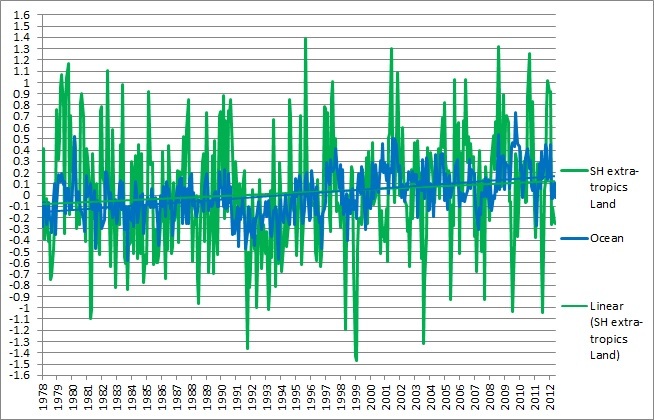 That’s why I decided to play the warmists’ at their own game, by using only the Bureau’s own data, which shows, among other things, that there has been zero trend in the data since 1995. 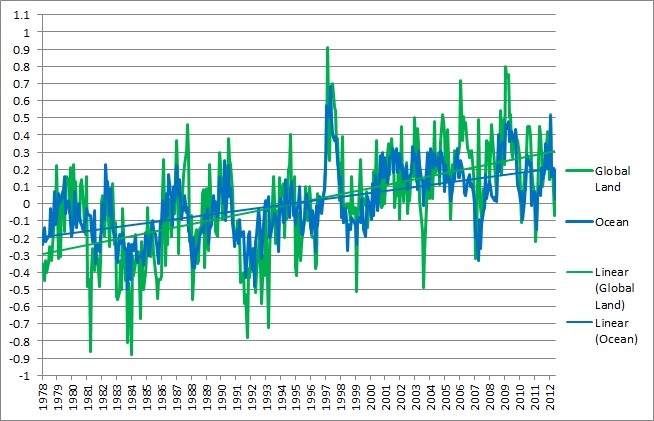 2012, at +0.11C, was the 36th warmest year- equal with 1995, just ahead of 1957. The past three years- 2010, 2011, and 2012- were the coolest of the decade. 2012 was cooler than 9 of the previous 10 years- beaten by 2011. 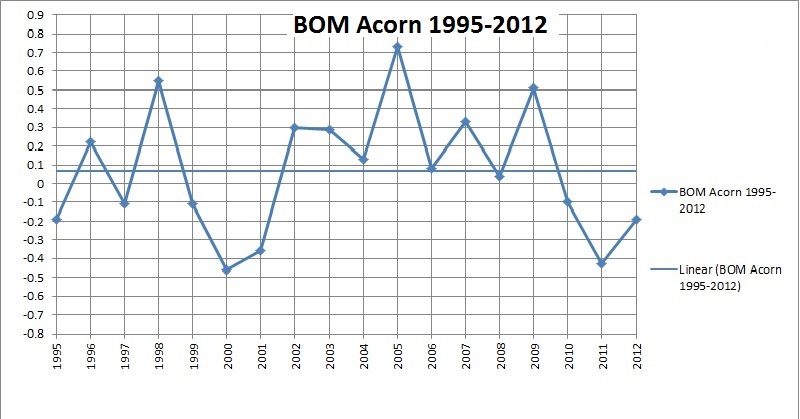 2011 was exactly at the median anomaly for the past 103 years, at -0.13C, according to Acorn’s homogenised record. Meanwhile the Climate Commission would have us believe that because a three month period has been a record, this is somehow proof of man-made global warming. Why? Because that’s all they’ve got left.